A couple of weeks after the Marikana massacre – where the South African police shot 47 striking miners during a wildcat strike at the Lonmin mine in the North-East of the country – I had to fly to Joburg, the city where I grew up. I had spent most of the flight thinking about Marikana, and my eyes were drawn to the mine-dumps that always announce one’s final descent: they surround this city, testimony to its history and its continuing, if diminished, dependence on the mineral wealth that gave birth to it. But where the landscape used to be defined by the dumps, they were now more like intermittent punctuation marks. They have all but disappeared from the city’s skyline, a fact I find a bit uncanny, because they were so immutably part of my experience of the place. It’s like visiting Paris and realising the Seine is gone. On the one hand, then, the enduring presence of the mine in the news, and, on the other, its slow retreat from visibility, from everyday life in the metropolis. My personal experience of the mines in Joburg was always split. My parents and grandparents were politically conscious people, in that anxious, low-key way that some middle-class white South Africans adopted, and I was always aware, growing up in Joburg, of the devastating impact of the mining monopolies and their legacies – the compounds, the segregated city, the dissolution of traditional agrarian society under the relentless pressure of the migrant labour system. On the other hand, growing up white in Johannesburg in the 70s and 80s meant that you were exposed to a different kind of narrative about the mines as well, one that was performed in tourist attractions like Gold Reef City and the Santarama Miniland (a lovingly made kitsch small-scale reconstruction of Joburg and other South African cities, down to the trains and cars on its roads). This was a sanitised version of the mine that stripped away its history of conflict and dispossession. 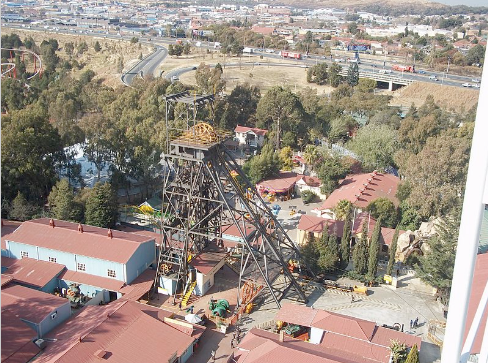 Middle-class Johannesburg reacted to the ineradicable material evidence of the mining it owes its existence to by commodifying it as a spectacle, attesting to the existence of the mines even as it screened the reality that underpinned it. I must say I found these simulacra hugely entertaining – these school outings were pleasurable in a way that exceeded their supposed pedagogic purpose, as if someone had slipped a visit to the fun-fair into the Afrikaner nationalist history syllabus, which was probably the most dreary, self-pitying narrative of its kind in existence. Perhaps growing up in this way, somewhere between the rhetoric of the mine union leaders and the wax replicas of miners in dioramas, made me notice the way in which the mine tends to appear in a split way when it is represented, when it is thought about seriously: in fact, it seemed the natural condition of a mine, hardly worth mentioning because it is simply common sense. But sometimes it is useful to think about these things that go without saying, because these are the nodes on which a particular world view is established, and I think one can say something about a cultural relationship to things that is engendered by our particular historical circumstances in South Africa, a relationship that is mediated specifically by our history of mining in this country. What do I mean by the mine as something that manifests in a split way in our cultural consciousness? 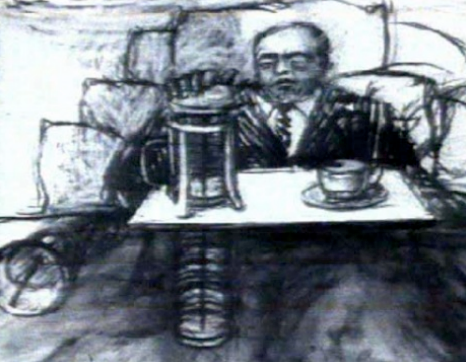 Take, for example, William Kentridge’s animated piece, The Mine, the first of his Soho Eckstein films, produced in 1991. It contains the famous coffee plunger scene: Soho, a wealthy industrialist, pushes down on his coffee plunger, which then becomes transformed into a mine elevator cage. In his chapter for Sarah Nuttall and Achille Mbembe’s Johannesburg: The Elusive Metropolis (2008) David Bunn claims that this is Kentridge’s “most materialist” film, because it uncovers the Real of the labor process beneath the surface of “nonchalant wealth”. As such, he contrasts it to Kentridge’s later films, which are more attentive to the transformative qualities of the surface. Bunn is suggesting that this film belongs to a now somewhat dated reading that locates the truth of the city beneath the surface, where mediation between above and below required the kind of symptomatic reading that was so characteristic of the 70s and 80s. I am not entirely sure I follow Bunn’s argument all the way here, though: what strikes me about the film is precisely the uncanny fluidity of movement between surface and depth; the way the one transforms into the other, as if the Thing of the mine is already present in the world of commodity objects, a sort of latent presence that begins to insist on its presence and effects an almost seamless, improbable, dreamlike transformation. What strikes me about this film is not that the mine is a buried truth, screened from the surface, but that the two spaces are in fact intimately bound together. What makes this description so striking is the way the mine appears in this erotically charged moment: one expects some objective correlative for the awakening passion, but instead one is confronted by a Thing in a more Lacanian sense, a formless looming shape in excess of its metaphoric role, a disturbance in the visual field: it is as if the scene can accommodate either the eroticism or the mine, but not both, and here where it is forced to do both it feels like an error of parallax. 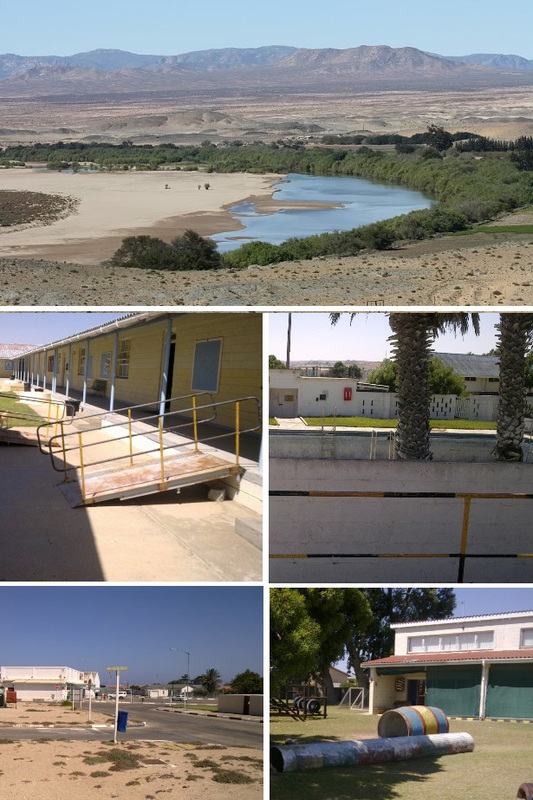 Here’s another example: Kleinsee is a virtually abandoned De Beers mining town on the west coast. In its heyday, it was a strange replica of a small town, somewhat out of time and place: it had schools, public transport, a completely modern middle-class life almost completely free of risk, mostly because it was fenced in by De Beers and fiercely policed to avoid diamond theft. Workers were not just searched but X-rayed as they came and left. This is where the managers lived. Recently the mine became unprofitable, so De Beers started closing down the town. It is now a ghostly place, the future of the abandoned libraries and community centres in the balance, the security cordon starting to fray. Next door, the people in Hondeklipbaai, who used to be completely dependent on the mine, face absolute destitution. The shacks are falling apart, and the community tries to scrape together a living in the middle of nowhere by mining illegally (there are still diamonds, but it isn’t profitable enough for De Beers to continue extracting them). So on the one side of this tattered fence in the wilderness you have the most destitute people dying as disused mine tunnels collapse on them, and on the other side of the fence a precarious abandoned middle-class time capsule, a bunch of security guards and the last of the middle managers. I think there are scenes like this all over the country, these improbable, porous proximities. Then there’s Joburg and the acid water: I’m not sure what’s happening with that these days, but for a while the Joburg newspapers were carrying stories about the acid water table rising. A typical story would read: “A toxic tide of acid mine water is rising steadily beneath Johannesburg which, if left unchecked, could cause earth tremors, power blackouts and even cancer among residents, experts have warned.” Again, it’s not so much that the reality of the mines is something that needs to be disclosed, or uncovered, beneath the surface: the mine, in this vivid post-post apartheid imaginary, is literally starting to buckle and transform the world on the surface; it is destroying the surface not in some violent upheaval but by leaking into it slowly. Perhaps the quintessential image that captures what I mean by this split or doubled quality is the Kimberley mine: this vast Thing in the middle of the town that it gave birth to; a potent and inescapable reminder of the material origins of wealth bumping right up against the city. 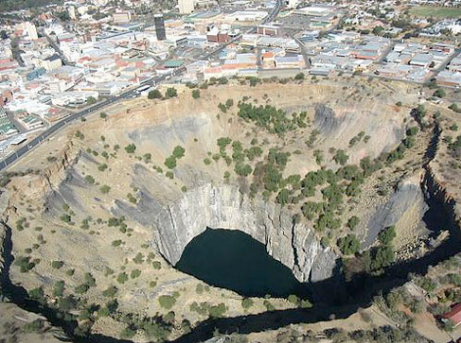 In fact, the hole is now completely commodified: it is Kimberley’s premier tourist attraction. So how can we begin to think about these images and narratives, and what they have in common? Well, let me make the obvious point, echoing a recent piece by Jeremy Cronin published in the South African Sunday Times of 29 April 2012: the South African Industrial revolution in the 19th century arrived all at once with oligopolistic joint-stock mining companies who extracted mineral treasure for the benefit of global capital, and not, as in Europe, over centuries via small-scale artisanship. Unlike many other colonial situations, however, capital did not simply flow out of the country, but was also deployed to consolidate a cultural and economic infrastructure in South Africa. This led to a somewhat unusual situation: a capitalist imaginary was developing right alongside the actual extraction of wealth, which was a process that involved the interlocked devastation of Southern African life worlds and damage to the environment. Gold and other treasures are ways in which wealth, which represents labour, can be stored in a money economy, but the real social and environmental cost of that labour has traditionally been screened from the developed economies (and cultural imaginary) that they support. In South Africa, a capitalist society was forced into close proximity to its traumatic, destructive material point of origin. We are everywhere reminded of the social and environmental cost of the economy and the cultural forms that it sustains. It means that our screens are not so much erected at the boundary of the nation, but inside it; our worlds of privilege exist in an uncomfortable propinquity to the Real, which is always experienced as a pressure against the edge. The world where objects are exchanged and where money changes hands, is entangled with the derealising trauma of its own origin, even in the form of rising acid water making property prices fall – a sort of invisible, cavernous beyond that can only be imagined as a collapse located in a constantly shifting near future. Of course I am not claiming that South Africa is unique in this respect. There are all kinds of historical precedents and parallel examples. In fact, this propinquity to the Real is increasingly becoming the cultural condition of the world: surplus populations are no longer contained by the boundaries of the nation state, the internet is increasingly saturating the cultural field with uncomfortable proximities, and so on. What we experience here, this derealisation that we register in our cultural production, is interesting precisely because it touches on an unfolding global future. Marikana represents a signal moment in the unfolding story of South Africa as a democratic state, a moment where the imaginary screen between privilege and poverty was, for a shocking and transformative moment, briefly removed.